It is very heartening to receive news of so many different retreats and events, especially for young people. Organisers frequently tell me that they receive many bookings after a notice has been posted here, so I am happy to help. During the weekend of the 18-20 September 2009. Young Catholic Adults (YCA are part of the International Juventutem Federation) will be running a Traditional Retreat at Douai Abbey in the south of England. The weekend will be led by Juventutem Ecclesiastical Assistant Fr de Malleray. Here are some particularly encouraging points to note: they show that Summorum Pontificum is working - as Fr Z says - "brick by brick." YCA will have the retreat centre to itself, and there will be a social in the evening. Fr de Malleray FSSP head of Juventutem will preach the retreat, and all Masses will be in the Extraordinary form. There will be a Sung Mass (Missa Cantata) in the main Abbey Church on Saturday 19 September 09 at 10am. (Choir: the Douai Singers) This will be followed by a Marian Procession at 11am around the extensive grounds of the Abbey. 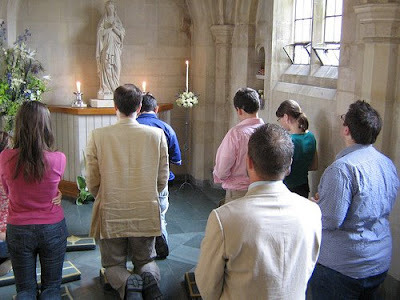 (If the weather is poor there will be Marian devotions in the main Abbey Church.) This event will be open to the public. There are also a few rooms allocated for all age groups (not just YCA) so please book soon. The weekend will be full-board (except for the Sunday lunch.) The cost will be from as little as £25 for students (or £48-88 for non-students). For more details, please see the notice at the YCA website or email juventutemcatholicam@yahoo.co.uk. Places are limited so please book early.